Check the shop for a new deal each day through Friday, December 19! There’s just one week left to order Zenyatta gifts for the holidays, and we’re going to make it fun! Starting tomorrow, we’ll release a special deal each day of the week. Check the shop every morning for details or sign up for our mailing list. Throughout the week, domestic shipping is a $5 flat rate. 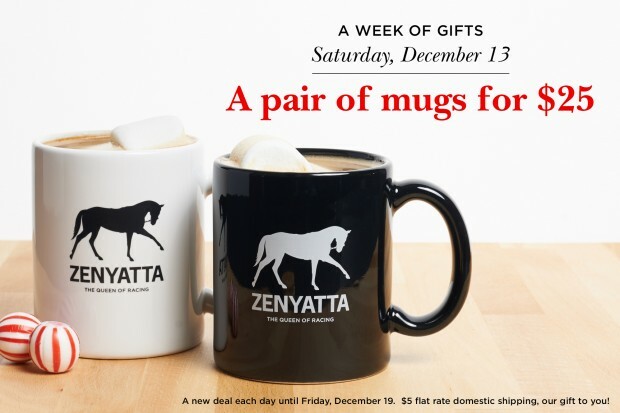 We’re releasing tomorrow’s deal on our brand new Zenyatta Mugs early—shop now! Details will be announced each morning at 6 am PST. We’d like to say thank you to all of our customers. The Zenyatta Shop supports the ongoing maintenence of Zenyatta.com and funds racing-related charities. Merry Christmas, Sheena, and wishing you many Blessings from God in the new year. with love, Elizabeth PS so enjoy all of your informative and interesting posts! MERRY CHRISTMAS to you, Zenny, and to your Fan Family! Running out of time, so I want to wish everyone here in Zenyatta’s family a very blessed Christmas. I pray for Zenny, her family, including her Fan family, every morning. You are all so wonderful and inspiring. Thank you so much for having given a new meaning to “family”. I so look forward to checking all of your posts every day. Merry Christmas and I pray many blessings from God for everyone, especially here on her website.